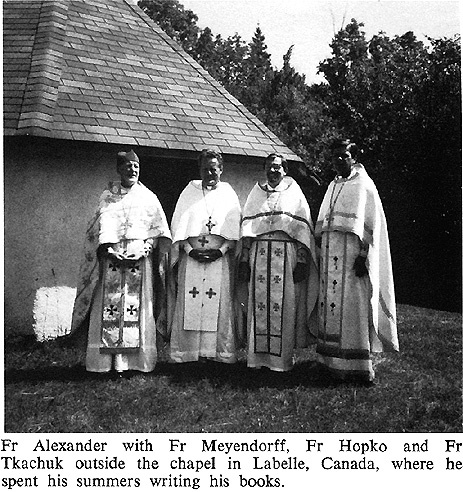 <Protopresbyter Alexander Schmemann: Thomas Hopko, "Two "Nos" and One "Yes"
Two "Nos" and One "Yes"
Father Alexander taught us that every time we "gather as the Church" there is a unique word of God that we have to hear. It is the task of every one of us to hear the unique word, which is spoken just for that occasion. At every celebration of the Eucharist, every liturgy, the Lord speaks to us with a word that is just for that time, for that day, for that occasion. It is the task of the Church to discover that word, and it is the task of the preacher to give it human words, to discover what God is saying to us at this time, in this place, when we are all gathered "in one place." God in Christ the Word, through His Spirit, through the person of Fr Alexander  in his life and in his death  has taught us, first of all, that this world is created by God and that it is good. How beautiful is this world! How glorious it is! It is the epiphany and the sacrament of God Himself. It radiates divine beauty. It radiates with the uncreated Light of the Godhead. It shines with the presence and the power of God Almighty Himself. Those who have eyes can see it; those who have ears can hear it singing, and we know that all is filled with the goodness, the power, the presence of God. Fr Alexander also taught us  by his life and by his death  that this world is fallen. Evil is real. There is wickedness. There is the Devil. In fact, this year at the orientation for the new students, Father spoke about this. Father always came to speak at orientation and this year too he came. Of course he was very weak, but he came and said to the new students: "I came over to tell you just one important thing. You will learn many things here about God, and the Seminary, and life and prayer . . . But I came over tonight to tell you just one very important thing." And he said to the students: "Remember always that the Devil exists." The Devil exists to destroy what God in Christ has given, and the Devil will use every trick to divide, to conquer, to separate, to produce that "unholy trinity" of pride, fear, envy, with competition and enslavement; and the "ego" will always be ready to cooperate with the evil "Voice" that speaks. The world is fallen, and it is fallen because we all, like Adam our father, have refused to lift up our heart and to give thanks to the Lord. Fr Alexander also taught us  by his life and by his death  that this world is redeemed, that this world is saved, that God has sent His Only-Begotten Son to give Himself for the life of the world, for the life not only of every human soul of which the whole world is not worthy, but for the life of all things: the whole creation, the plants, the animals, his beloved hippopotamus! All that God has made will be saved, resurrected, restored, renewed in Christ Who has risen from the dead, for death itself, in that restoration, becomes the instrument of victory. How many times he said, " . . . through the Cross  and only through the Cross  has joy come into the world." The world is good, the world is fallen, and the world is redeemed. One day in August 1968  15 years ago, when Father was still healthy, it was a beautiful sunny day like today  we were sitting and talking in Labelle, in Canada which he loved so much, where he spent the summers. And of course we were talking about the Church, theology, and so on. He said to me: "When I die, you can write my in memoriam in one brief paragraph." He said, "You just have to say that my whole worldview, my whole life, could be summed up in one little sentence: two nos, one yes, and eschatology  two nos, one yes, and the Kingdom to come." The first "no" was to what Father called secularism  any kind of explanation of this world as having its meaning in itself. He loved to quote the French poet, Julien Green, who said, "all is elsewhere." All is elsewhere, and this world has its meaning from "elsewhere." And any attempt to dare to explain this world except as from God must be rejected. The world has no meaning in itself. None at all. The second "no"  in a very peculiar use of the term, of course, which confuses some people  is when Father said, "We must also say no to religion." Christ did not bring religion; Christ brought the Kingdom of God. Christianity is not a religion to help secular man to cope with his "problems." Man does not have problems, he has sins. This world does not need "therapy"; it cant be "helped." It has to die to rise again. There is one sentence in For the Life of the World where Father says that this, as a matter of fact, is the heart of the matter.
. . . It is here that we reach the heart of the matter. For Christianity help is not the criterion. Truth is the criterion. The purpose of Christianity is not to help people by reconciling them with death, but to reveal the Truth about life and death in order that people may be saved by this Truth. Salvation, however, is not only not identical with help, but is, in fact, opposed to it. Christianity quarrels with religion and secularism not because they offer insufficient help, but precisely because they suffice, because they satisfy the needs of men. If the purpose of Christianity were to take away from man the fear of death, to reconcile him with death, there would be no need for Christianity, for other religions have done this, indeed, better than Christianity. "No"  "no" to secularism. "No" to religion in that sense.
. . . the entrance into the risen life of Christ; it (the Church) is communion in life eternal, joy and peace in the Holy Spirit. And it is the expectation of the day without evening of the Kingdom . . . the fulfillment of all things and all life in Christ. In Him (Christ) death itself has become an act of life, for He (Christ) has filled it with Himself, with His love and His light. In Him (as the apostle Paul has written) all things are yours; whether . . . the world, or life, or death, or things present, or things to come; all are yours; and ye are Christs; and Christ is Gods (1 Cor. 3:21-23). And if I make this new life mine, mine this hunger and thirst for the Kingdom, mine this expectation of Christ, mine the certitude that Christ is Life, then my very death will be an act of communion with Life. For neither life nor death can separate us from the love of Christ. I do not know when and how the fulfillment will come. I do not know when all things will be consummated in Christ. I know nothing about the whens and hows. But I know that in Christ this great Passage, the Pascha of the world has begun, that the light of the world to come comes to us in the joy and peace of the Holy Spirit, for Christ is risen and Life reigns. For the Lord Himself will descend from heaven with a cry of command, with the archangels call, and with the sound of the trumpet of God. And the dead in Christ will rise first; then we who are alive, who are left, shall be caught up together with them in the clouds to meet the Lord in the air; and so we shall always be with the Lord" (1 Thess. 4:16-17). If Father has sinned against any one of us we should forgive him. We should ask him to forgive us our sins. And, in faithful and loving devotion to what he has shown us  in his life and in his death  brothers and sisters, let us love one another, let us lift up our hearts, let us give thanks to the Lord. Amen!